"This next test involves turrets. You remember them, right? They're the pale, spherical things that are full of bullets. Oh wait, that's you in five seconds. Good luck." Sentry Turrets are miniature tripod robots that appear in every game in the Portal series. They are seen as incapable of independent movement, but can open each side of their chassis (their 'arms') horizontally in order to reveal two gatling guns. The central part of the chassis holds their red eye, which emits a targeting laser. Almost all of the space within the Turret is devoted to storing the ridiculously stacked ammo, explaining the nearly infinite supply of ammo when firing. Turrets can be avoided, disabled or destroyed in a number of ways. The most common method is knocking them over, causing them to flail and fire wildly before deactivating. This can be done by picking them up and dropping them, or using any object to tip them over. Additionally, the Discouragement Beams or Emancipation Grills can be used to completely destroy them. In Portal, Turrets will shoot the glass when the player is on the other side. In Portal 2, however, Turrets will only follow the player behind glass. The Sentry Turrets are voiced by opera singer and voice actress Ellen McLain. The Aperture Sentry Turret has a single red eye, sleek appearance, and predominately white color scheme common to most Aperture Science technology. Sentry Turrets are commonly seen serving as (rather ineffective) guards in the maintenance areas of the Enrichment Center, and during testing as an obstacle to the Test Subject. Sentry Turrets often speak in a sweet child-like, artificial voice similar to GLaDOS and a lavatory bowl within the Enrichment Center. They have a strangely polite demeanor, which is in direct contrast with their deadly behavior. They will even forgive Chell for knocking them over, suggesting they do not want to kill Chell. In one scene in Portal 2, an Oracle Turret is seen stuck inside the Aperture Science Pipe Network, who attempts to get Chell and Wheatley's attention. At Wheatley's encouragement, Chell ignores it, but the Sentry Turret politely says "thanks anyway" with a hint of shattered hopes. It can later be seen and picked up in the incinerator room. The Sentry Turrets are armed with two dual machine guns, which can only be armed once a target comes within visual sight. Upon visual acquisition of the target, the Sentry Turret will come to full alert, and the machine guns will emerge. They will begin to fire at any visible targets (usually Test Subjects or intruders). When no targets are in visual range, the Sentry will scan the area in a sweeping motion with its laser targeting beam. Upon seeing that there are no more targets, the Sentry Turret will return to sleep mode after three seconds. These weapons, the machine guns, along with its antenna are normally hidden inside the body, during the Turret's "sleep mode". When passed through the material emancipation grill, they will emit a loud and long "oowowowowow" sound as it disintegrates, even if deactivated, suggesting they are only put in sleep mode when knocked over. The machine gun panels also close together in an erattic position if the turret is vaporised active. Aperture-Brand Resolution Pellets, the bullets for a Sentry Turret's guns, are simply dumped into its hollow body, called the Shell Redistribution Chamber; this allows for an unusually large supply of ammunition for such a small device. Aperture-Brand Resolution Pellets are the only type of ammunition that is recommended for use with a Sentry Turret. In addition, bullets are not "fired" in the traditional sense. They are propelled, shell and all, with a spring-loaded mechanism called the Projectile Acceleration Cylinder, which is guarded by the Aperture Turret External Barrel. The Personality Core of the Sentry Turret is located within the outer shell, right above the guns. It is fitted with a Fire/No Fire Incident Resolution Chip, presumably to help the Turret distinguish when or when not to fire, an Empathy Generator and an Empathy Suppressor. Apparently, the Empathy Suppressor is of greater influence, as simply standing near a Sentry Turret may cause its Empathy Suppressor to accidentally activate, greatly reducing the Sentry Turret's feelings of empathy toward its foe. The consumer version of the Sentry Turret is available in hundreds of different designer patterns and colors, including "Forest", "Desert", "Table", "Evening at the Improv", and "What Idiot Picked This?" (the latter three schemes being humorously named by Cave Johnson). Detailed in a Portal comic strip, the inception of the Sentry's strange disposition for singing and using melodious tones came from Aperture Science consumer product testers using the weapon as a possible use for protecting children from criminals. The test is a success but the baby begins to cry every time so they decide to include soft tones and lullabies. The second test is then deemed a success with the sleeping child. Sentry Turrets, when idle, conceal their weapons under the two plates on either side of their body. When they spot a target it takes a moment to deploy its weapons to fire. A Sentry Turret's weapons are very powerful and are able to kill a human, such as Chell, after a few seconds of continuous fire. Atlas and P-body, while sturdier than a human, still cannot endure lengthy sustained fire before falling apart. However, Sentry Turrets can be easily spotted by the visible laser beam emitted from their eye at all times, making it easier to avoid them. When knocked over Sentry Turrets fire frantically in all directions before permanently deactivating. Like all other objects within the Enrichment Center, the Sentry Turret will disintegrate (and produce an unusual sound) if it passes through a Material Emancipation Grill. In Portal, the primary method of defeating the Turret is to disable it via knocking it over (echoing the method used in Half-Life 2). This can be accomplished in various ways: by picking it up from behind and dropping it in an odd position, knocking it over with a weighted cube, hitting it with another object (including another turret), shooting a portal at its feet, or directing a High Energy Pellet into it (the Pellet will not destroy the turret on impact, but it will impart enough force to knock it over). They can also be destroyed by standing in front of a turret while holding another turret, however, this is difficult to do. Portal 2 introduces two new means for the player to disable the Turrets. One is to direct a Thermal Discouragement Beam onto it (usually via a portal and/or Weighted Pivot Cube), causing it to heat up and explode. Another is to cover it in Repulsion Gel or Propulsion Gel (via the Perpetual Testing Initiative), causing it to bounce with increasing force until it either shatters or falls away. In contrast to Portal, Portal 2 Sentry Turrets will not attempt to shoot at enemies if glass is between them, while still tracking the enemy with the laser pointer (They will, however, shoot at the player when 2 panes are between them and the player in some circumstances). A Hard Light Bridge will prevent the Turret from even detecting the enemy, making it go to sleep. During Portal 2's chapter The Escape, Chell passes through the production line for the commercial version of the Aperture Science Sentry Turret. The developer commentary states that originally, they would have had the Sentry Turret built and boxed, then passed into a machine directly below. This machine would unbox and disassemble it, then recycling the parts, meaning that the Sentry Turrets are never actually shipped. They also would have included a massive pile of all the unrecycled packaging material, giving Aperture the most inefficient recycling system possible. Some of the Sentry Turret's sounds were not used in the game, but can be found in Portal's Game Cache File, including "Hello" from Portal 2 teaser trailer and "Your business is appreciated," played when flushing the lavatory bowl in the Relaxation Vault. Sentry Turrets will fire at rockets fired from a Rocket Sentry. This is not seen in-game, as they normally never encounter each other. Portal 2 features numerous Defective Turrets, either missing their casings or assembled incorrectly. The Sentry Turrets are powered by a compact fusion core. It can be seen on the caseless Defective Turrets, on their back. The turret box states that one of the blue turrets was bought on January 25, 2010 by a person with an unreadable name. The reference to Michael Jackson can be seen on the posters. In Portal 2, turret boxes indicated that turrets inside are blue. However, the machines in Turret Manufacturing build and box white turrets. Though Frankenturrets are able to move about with their legs, normal Turrets do not seem to be able to. This would indicate a usage modification which ultimately failed on Wheatley's part. However, turrets are able to fold their legs inside of themselves for storage. Frankenturrets, lacking the back leg, might be attempting this motion in a way that would drag themselves forward. In Portal, turrets will stay in the position they were picked up in when held (i.e. picking up a turret upside-down would make you keep holding it that way). In Portal 2 they automatically rotate to upright and facing away from the player. When turrets are knocked over, they spin around wildly firing in all directions, this will cause them to deactivate themselves. If you can pick them up quick enough they won't deactivate. Despite the fact that the bullets fired from the Aperture Science Turret are propelled using a spring, the guns produce a muzzle flash and a noise; this is unusual considering that there is no gunpowder, or explosive propellant being used. In the Turret commercial, Cave Johnson says that the bullets are rammed into the Turret to have maximum functionality. Pointing a turret at a Wheatley monitor will cause the turret to shoot at Wheatley's image, therefore implying they see him as a threat. Turrets have been seen to be female, as an unused turret line states "I never liked her anyway." 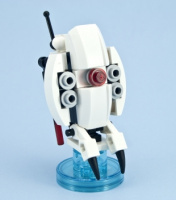 The Sentry Turret appears alongside several other Portal 2 characters in the Portal 2 Level Pack for LEGO Dimensions. In Portal 2, Sentry Turret gibs (when exploded with the Thermal Discouragement Beam) appear to use the Portal textures, as the eye's texture looks vastly unlike the Portal 2 striped version. Sentry turret from Portal 2. This page was last modified on 4 September 2018, at 03:22.